The sun's shining (yes, even oop North) and the pub beckons, but first a quick update and predictions for this weekend. We did pretty well last week, calling the usual average of 50% of results correctly and winning £23.35 at the bookies, on £10 stakes for each game. That puts the running total at + £66.68 in the five weeks since I've been calling bets in public. 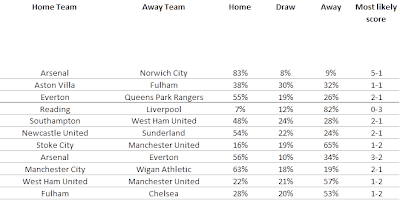 Here are this week's percentages, out to next Wednesday's games (might rerun these if the starting line-ups change). Watch that I've now swapped the order to list Home / Draw / Away like everybody else does. I'm off to the pub to spend last week's winnings. Enjoy the weekend! given these circumstances and assuming your model is accurate enough and that there will be no surprises on the starting line-ups; rather than backing the home win i would opt for laying it since the market is off by 13% in comparison to your expected probability or even better back Wigan +1.75 @ 1.87. Thanks for the comment, yes this is something I've been looking at closely. At the moment, the model's not quite accurate enough to make it work. What seems to happen is that betting on differences between bookies and my model, leads to betting on outliers where the model is wrong, rather than situations where the model's calling results better than the bookies are. It's nearly there - just a fraction behind market odds accuracy - but at the moment, would slowly lose money if you use likelihood differences.